Roll up your sleeves, warm up your oven, and find a new favorite bread.From intense, chewy sourdough to light, airy focaccia, many of today’s most popular breads are best when they’re fresh from the oven. Then again, that’s always been true.The timeless allure of fresh bread has been part of Mother Earth News magazine since 1970, when they published their first issue. 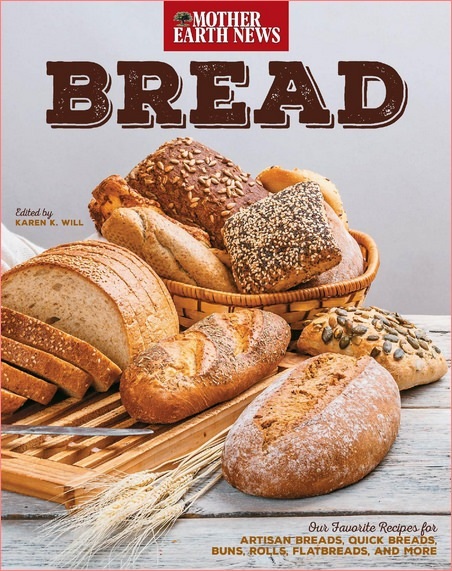 In Bread, for the first time, the editors have collected their very best recipes and techniques. You’ll find all the classics, including rustic white, whole-wheat sandwich bread, and sourdough. There’s plenty of quick-breads and page after page of country and holiday favorites, such as skillet cornbread, Irish soda bread, and fruit- and nut-filled harvest breads. Go beyond the traditional and try your hand at flatbreads, boiled breads, naan, bagels, pizza crust-even gluten free breads. With more than 150 tried-and-true recipes to choose from, you’re sure to find new loaves to love.